As spring begins the Big Dipper is located high in the northeastern sky at sunset and is easily seen all night long. This celestial placement allows the night sky traveler maximum evening navigation. Note: The Dipper swings to the west in a great arc around the north pole, 15 degrees* for every hour. By dawn it lies low in the northwest. *10 degrees is one width of your fist at arm’s length. With each spring night the Big Dipper appears higher in the sky after the Sun sets. By mid-spring, the end of April, it reaches maximum altitude around 10:00 pm. By the end of spring it is high in the northwest. As the seasons progress the Big Dipper is seen further west as the Sun sets and its maximum navigation occurs during the early morning hours. Begin by locating the Big Dipper in the Great Bear Constellation. The following directions and maps will enable you to journey to six stellar destinations in five constellations during maximum navigation time! The Big Dipper can help you locate magnitude. These first magnitude stars are Arcturus, Spica, Regulus, and a ? star ?.They all shine bright in the springtime night sky. This ? star? is the brightest star seen the most often and it is not Sirius! It never sets in far-northern locations like Minneapolis and Seattle and it remains in the sky most of the time even in more southerly locales. To find out which star this is and how the Big Dipper can help you find it, keep reading. Thanks Star Gazer for this guessing game. You're always a lot of fun! late May midnight, early June 11p.m., late June dusk. From the handle of the Big Dipper arc to the fourth brightest star, yellow-gold Arcturus, in the constellation Bootes, the Herdsman. 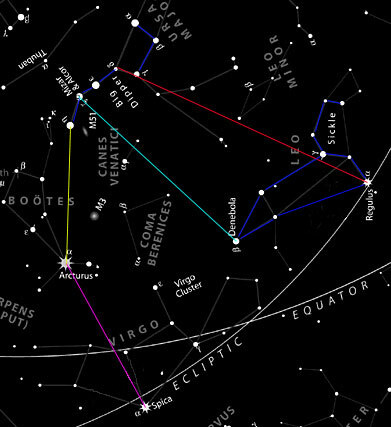 Spike down from Arcturus toward the southwestern horizon to locate blue-white Spica, the sixteenth brightest star, in the constellation Virgo the Virgin. Note: Esoterically Arcturus is the herder of the Divine Will emanating from the 7 stars of the Big Dipper and acts as a bridge between these 7 stars and Virgo the Virgin, which nourishes the Christ consciousness within the form. The stars at the back of the Big Dipper's Bowl point west to blue-white Regulus, Leo the Lion's heart and twenty-first brightest star. Upon closer inspection, the star at the bend in the Big Dipper's handle can be seen with the unaided eye to actually be two stars, the brighter Mizar, and its fainter companion, Alcor. Use these stars at the bend of the handle to locate the cosmic Lion's tail star, Denebola (which means tail of the Lion), drop down from Mizar and Alcor moving southwest toward a triangle of stars. Denebola is the eastern point of the triangle. Note: With Arcturus and Spica, Denebola forms a large equilateral triangle. An even larger triangle is formed with Regulus placing Denebola the Changer who can pass swift judgment, right in the middle! Which Star Is the Brightest and Seen Most Often? Capella, the goat star, is the brightest star of the constellation Auriga the Charioteer, which hundreds of years ago was depicted as both a charioteer and a goat herder. The 3 dim stars near the nanny goat, Capella, are called "The Kids". BTW: Auriga and Santa are closely related. is actually a four-star system as revealed by a spectroscope. To find Polaris, the North Star, in Ursa Minor use the pointer stars at the front of the Big Dipper's bowl. As you Look Up in the night sky, the distance to Polaris appears to be six times the distance between the pointer stars. As you go outside and Look Up at the springtime Big Dipper it appears to be pouring out its heavenly contents upon our awakening Earth. It is said that the energies pouring down produce a stimulation of the will-to-serve God's plan. The world's need, together with spring's Three Planetary Spiritual Festivals, make this an especially auspicious time to align with these spiritual energies. night sky traveler in unexpected ways.